It could have been anyone’s game, but it was apparent from the first couple of jams that Atlanta had the upper hand in this match up. 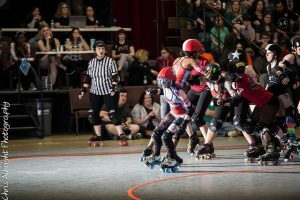 With the help of jammers The Merchant of Menace and Nora Gretz, Atlanta jumped out to a sizable lead, holding Maine to a single digit score for most of the first half. 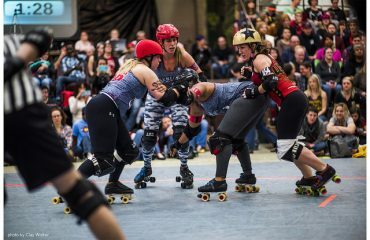 Maine’s small roster fought hard with great blocks by Shirley B. Slammin and Punchy O’Guts, but they couldn’t get their jammer through enough times to score many points. At half time, DSDG was leading 79-20. However, after half time was a whole other story. Maine came out of the locker room with some serious energy and Atlanta had a hard time keeping their jammer out of the box. Grim D. Mise scored 19 points in the first jam of the second half, then Crystal Whip followed it up with 8. All of a sudden, Maine was back in the game. Unfortunately the penalty tides turned, and Atlanta was able to keep most of their players out of the box, while Maine started filling it up. The score was within 30 points until some excellent Atlanta walls with Scout SnipeHer, Alassin Sane, and Rebel Yellow, as well as apex-jumping by jammer Hollicidal really opened up the spread. Grim had a 24-point final jam for Maine, but it wasn’t enough to bring home a win. Atlanta’s Dirty South Derby Girls won with a final score of 181-114.